Or if you can't find the spice packet you can make your own! Heat Tagine in oven at 200 degrees for about 20 minutes. Then, heat oven to 350 degrees. In a small bowl combine either the paste packet or the spices. Clean chicken and pat dry. Rub or sprinkle paste or spices over the chicken. Add 2 tablespoons of olive oil to the Tagine. Arrange chicken in Tagine. In a bowl toss together potatoes, tomatoes, garlic and apricots with 2 tablespoons olive oil. Spread veggies and apricots around chicken. 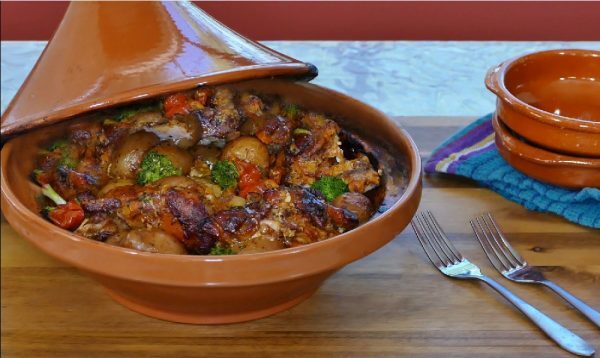 Cover the Tagine with the lid and bake in the oven for about 1 hour. Check chicken for doneness (165 degrees internal temperature). Stir juices over top of chicken and vegetables. Garnish with fresh parsley and serve in the Tagine base.